The college you choose should have everything you feel you will need to get the type of education required to excel in your chosen career. Before choosing that college, you will need to visit several campuses to determine which one is the perfect fit for you. What Questions Should You Ask During Your Tour? When you are taking a college tour, there are specific questions you should ask that will give you the information you need to make a good decision. Asking about their financial aid programs and the student activities they offer are extremely important. If you are going to need extra income, ask them if there are any job opportunities on campus or nearby. A college visit is normally limited to just a few hours so you want to get as much out of it as you can. Take a tour of the dormitories and cover as much of the campus as you can. Talk to teachers and students if they are available. Check out the library and student resource areas to see what type of activities and clubs are available to you. Make a list of things you want to see and take a map of the campus, so you don't waste time finding specific buildings. What Should You Look for on Your College Visit? Look for new opportunities and challenges! Identify where your classes will be if you already have a specific minor/major in mind. Know where the main office is as well as any other important buildings you will need to visit. Look for parking areas if you will be driving a car to school. 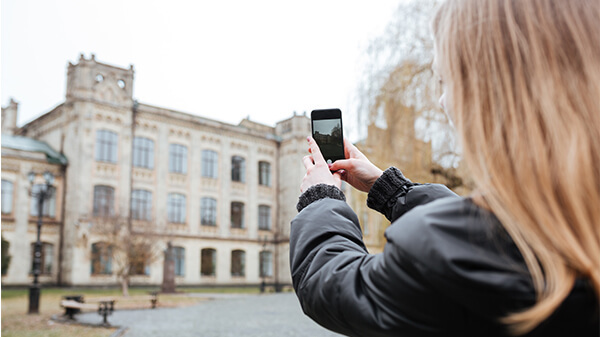 It's also essential to identify important buildings and places that are located off campus as well. Know where the police stations and local firehouses are. Are there parks or “green” areas nearby where you can relax and get away from the stress of school? When Is the Best Time to Schedule Your College Visits? Some people recommend late spring of your junior year or late summer/early fall of your senior year. In most cases, it’s a personal choice. During the late spring, school is still in session and you will have more people to talk to. Late summer is relatively quiet and will allow you to have better access to certain areas. Finding the right college is a process. Visit a few of your top choices and compare notes. Take your time and choose the one that best suits your needs. You only have one "first time" at college. Make the most of it! University Frames, an American company based in Anaheim, CA, has been providing custom diploma frames since 1990. We offer quality diploma frames that fit your taste and style. We are committed to providing the best customer experience through our quality craftsmanship and attention-to-detail approach. Contact us to get a custom diploma frame and show off your pride! How Can You Overcome Test Anxiety in College?